The Safe and Smart City Conference fosters exchange of knowledge and expertise among policymakers and experts on the topic of key importance to France and Israel – development of safe, inclusive and smart cities. The second edition of the conference, which was held in Nice on March 22-23, has been a great success as it outlined a real will from French and Israeli decision-makers to cooperate closely on shared challenges on both local and national levels. The conference attracted great interest and received coverage on national, local, print and online media. 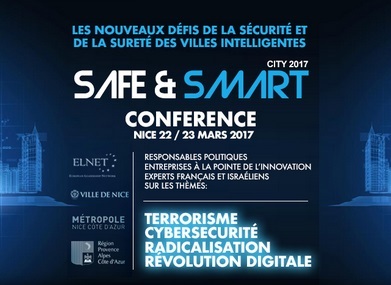 The Safe and Smart City Conference 2017 was organised by ELNET in partnership with the City of Nice and the Provence-Alpes-Côte d’Azur Region. It brought together around 300 participants and an exceptional panel of 36 French and Israeli speakers to reflect on the safety and security of smart cities, including the topics of cyber security, digital revolution, radicalisation and terrorism. List of speakers included Yoram Cohen, Former Chief of Shin Bet, Christian Estrosi, President of the Provence-Alpes-Côte d’Azur Region, Caroline Pozmentier, Deputy Mayor of Marseille and Vice-President of the PACA Region, Dr. Anat Berko, Member of the Knesset, Nathalie Goulet, Senator of the Oise region, Frédéric Pechenard, Vice-president of the Ile-de-France region in charge of security, Ronit Ben Dor, Minister of the Embassy of Israel, Roni Tidhar, Security Manager at the Ben Gurion Airport, and Orit Perlov, an INSS expert on radicalisation. They have been joined by representatives of leading French and Israeli companies, as well as representatives of innovative start-ups, as well as experts and professionals. The next edition of the Safe and Smart City Conference will be held in 2018 in Israel.